After posting a little tour of our living room, I've had a lot of questions about the prints above the couch. They were so cheap for the size and transformed our space! The best part is…anyone can do it! It only takes tools to hang it up. 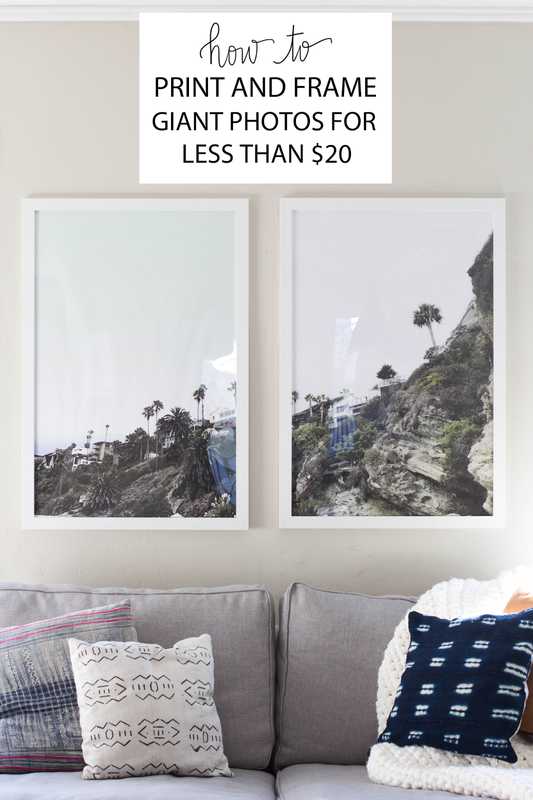 Keep reading for how to print and frame giant photos for less than $20. EDIT: After many requests, these two photos are available for digital download in my Always Rooney Print shop! For just $8 you'll receive a download of both prints as well as the original landscape photo (not cut in half). You can purchase it here. Please note these prices are priced in the United States so I apologize I can not say this info is true in every country! For the prints, I chose two photos from our recent trip to California that I took on my iPhone 6. The photo was horizontal, so I took it into photoshop and resized it to measure 24x36 by increasing the size by 10% at a time (you can do this in Preview on a Mac or any other editing program). It takes a few minutes to do this but it prevents the photo from being pixelated. After resizing, I split it in half to make two vertical photos. 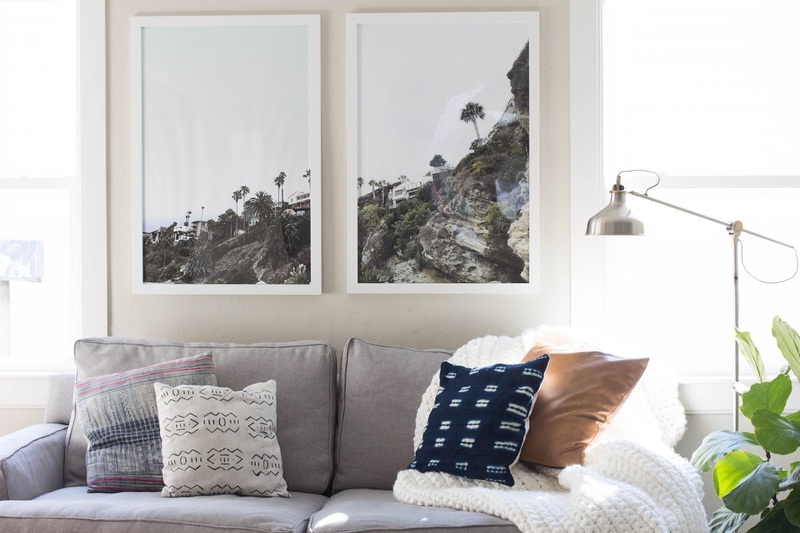 Send the prints to Staples and get the photos printed into Colored Engineer Prints. Mine are 24x36 and cost under $6. Black & White photos run for less than $4! For the frames, my biggest tip is to get these frames only when Michaels is having a sale (which honestly seems like every week). I found mine at Michaels for 60% off plus an additional 20% off which brought the total to $16. They have a variety of sizes and we have probably bought 6 or 7 so far. There you have it- an oversized statement piece for $20! 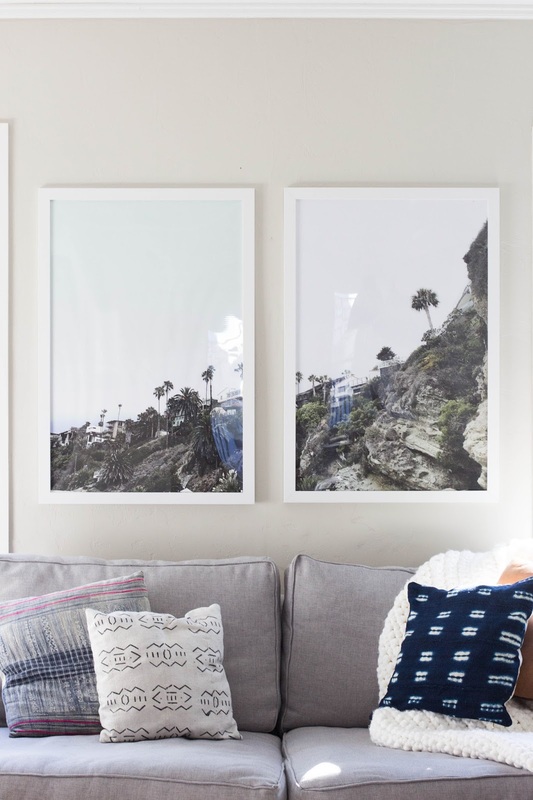 Do you have anywhere that would be perfect for a giant framed print? Amazing post. I glad to found your blog. Thanks ! Glad you are following along, Thanks!! I swear by those Michael's sales on frames as well! They're awesome for the price and easy to embellish with paint, tape, or gold/brass brackets. Aren't they the best? We have them in every room in our home! Love the idea of making them your own! These photos are really awesome! But, I can't help noticing your beautiful blanket in all of your living room photos. It turned out so pretty! I'm working on a similar one now and love how fresh-yet-cozy the white yarn looks. Thanks so much Whitney! The white yarn just makes everything seem so much more cozy! love love love your photo! Try a reprographics (i.e., blueprint) shop before hitting up Staples or FedEx/Kinko's. Most reprographics' shops are small, family-owned businesses AND (in my area; I own/run a repro shop) are much cheaper than the big shops. Nice tips! Gives me the incentive to print and mount some of my own photographs! Wonderful photos. I like it. Thanks for sharing. hello, I was wondering if by "colored engineered prints" you mean the engineering prints that is on staples website. The ones that say not recommended for photos? I wasn't sure if that was the right type or not.. Yes I used the one that said "not recommended for photos" and it worked just fine. I just took a chance!